What if all of Hartford became an interactive museum? Suppose you could walk through the City and see historical photos from exactly where you’re standing. Or learn the story behind a prominent landmark as you’re looking at it. Or experience an event from years ago where it happened. Suppose all this was available for free via your phone or tablet. Technology has the power to create new and unique experiences. This proposal is a basic version of augmented reality, adding layers of information on top of what is experienced in real life. The implementation could be relatively simple. Once a mapping platform is selected, a variety of content could be linked to locations on the map. Start with photos, like those published regularly in the the Old Hartford Facebook group, allowing pedestrians to walk the City and compare now and then in real time. Partner with local institutions, and other content owners, to identify additional historical items. This isn’t a new idea for Hartford. A couple years ago a small group of volunteers created an audio tour of sites in and around Bushnell Park. It continues to be available as downloads on the iTunes Store or directly on the internet. Link these resources into Interactive Hartford too. I throw this out as a business idea for others to consider, as I’m not tech savvy enough to make it happen on my own. Maybe it’s a proprietary app that allows users to be notified when they pass a site, or when new points of interest are added near them. Or maybe it’s a layer on someone else’s mapping platform … I don’t know. I would be more helpful with product usability and business planning than technical design and development. Give it some thought Hartford creatives. I’m happy to talk it through, and would love to be involved at some level if anyone wants to give it a go. Interactive Hartford would enhance the experience of visitors to the City. If done well, Hartford could serve as the pilot site, and the technology could evolve into a business serving other cities too. The Hartford City Council has held numerous public hearings and committee meetings in an effort to better understand the Downtown North proposal. They have dramatically increased the amount of information available to the public. I’ve followed the discussion, and see many positives to the proposal. Yet, I still find myself opposed to the project. I see building out the site as a luxury, and as a distraction. Hartford has a more important priority right now; restructuring municipal finances and operations to put the City on a sustainable path. My primary concern is that if Downtown North is approved that it will be much more difficult to make the hard choices that a restructuring will require. There are positives to the proposal, and the first phase of Downtown North seems likely to achieve meaningful goals. There is a good chance that the main benefits would be realized. Baseball would expand and diversify the City’s entertainment options. A grocery store would address the food desert in the northern neighborhoods and provide a new option for the increasing number of Downtown residents. Main Street would be transformed north of the highway. Clay Arsenal would be reconnected with Downtown. There would be more construction jobs. Hopefully phase one would also create momentum that would ensure the entire project is completed. The Downtown North business case for the City is approximately revenue neutral. The business case has been portrayed as a positive, though I see it as a negative. The Administration is projecting that the City can achieve the benefits listed above without increasing the property tax. The ancillary development can create new revenue that will more-or-less offset the expected costs of the land preparation, stadium construction, and public infrastructure improvements. 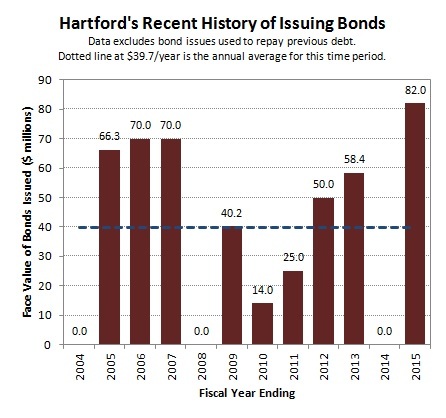 Unfortunately, Hartford is in a position where it has to do better than financially treading water. Increasing expenses at the same pace as revenues doesn’t improve the City’s financial position. Other criticisms of the proposal also resonate. Stadiums, in general, are regional assets. They provide entertainment to all of the surrounding towns while generally losing money. Asking the City of Hartford, a financially stressed municipality with very low median income residents and a highly taxed business community, to take on the facility alone doesn’t seem appropriate. The financial model of professional baseball, specifically, has regions paying for the privilege of hosting a team. Again, it does not seem appropriate for the City of Hartford to subsidize this entertainment option on behalf of the entire region. There has been virtually no discussion about how the XL Center is impacted by the proposed baseball stadium. Hartford needs to ensure that the XL Center, which is the more important of the two sports venues and is already funded at the state/regional level, continues to be successful and remains a top priority. When looking at the big picture, Downtown North seems like an acceptable project, but not a great one. Choosing to move forward will not expose the City to an unreasonable amount of risk, and would bring some positives. However, committing time and money to Downtown North will distract from a higher priority effort that the current political leaders have already agreed is necessary. Approving Downtown North will send conflicting messages to stakeholders that will need to make concessions in the form of higher taxes, fewer services, or fewer benefits as the City works to find a sustainable path. The best course of action is to put Downtown North on the back burner until the City has an opportunity to reorganize. It could take years to get Hartford’s proverbial house in order, and at that point the environment may be different. The numerous early-stage Downtown construction projects will be much further along, if not complete. The influx of new residents may even change the priorities for the Downtown North site. Hartford needs to set sustainable municipal goals. Hartford needs to agree on primary strategies for working towards those goals. Hartford needs to organize and focus its operations around the goals and strategies. Once those steps are complete, the City will be in a much better position to consider proposals like the one currently on the table for Downtown North. Moody’s Investors Service downgraded of the City’s credit rating in the midst of an active debate about a significant construction project on the Downtown North site. The Mayor interpreted the downgrade as highlighting the importance of economic development. He also implied that the financing structure currently proposed for the Downtown North project is the best available option. Downtown North supporters using the rating downgrade as evidence the project should move forward need to be absolutely sure that the proposal grows the taxable Grand List without earmarking those new tax receipts to pay for the development. Otherwise the project doesn’t address the City’s financial situation. Others saw the downgrade as a warning that the City is stretched too thin, and a reason to reject the current Downtown North proposal as an imprudent financial commitment by the City. Opponents need to realize that the downgrade is independent of the ballpark-centered proposal. Stopping the Downtown North project doesn’t speak to Moody’s concerns either. There are a limited number of ways that the City’s financial position can be improved – increasing revenue, reducing spending, or improving operations are the most common. Concern about the credit downgrade needs to translate into constructive action to address the problem. 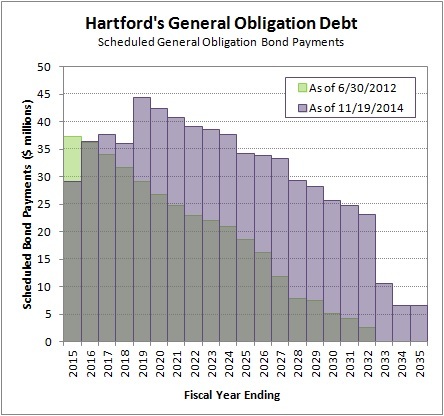 Does this mean that it’s time to get serious about reviewing Hartford’s goals, strategies, and overall business plan? Fortunately, the Hartford Committee on the Restructuring of City Government was created to start this exact conversation.